Taking a cue from Erving Goffman’s classic work, Asylums, Tia DeNora develops a novel interdisciplinary framework for music, health and wellbeing. Considering health and illness both in medical contexts and in the often-overlooked realm of everyday life, DeNora argues that these identities are by no means mutually exclusive. Moreover, she suggests that the promotion of health and more specifically, mental health, involves a great deal more than a concern with medication, genetic predispositions, clinical and neuro-scientific procedures. Adopting a holistic, interactionist focus, Music Asylums reconnects states of wellness and wellbeing to encounters with others and - critically - to opportunities for aesthetic experience. Building on DeNora's earlier work on music as a technology of self in everyday life, the book presents music as an active ingredient of action, identity, capacity and consciousness. From there, it suggests that access to, and evaluation of, music is an important ethical matter. 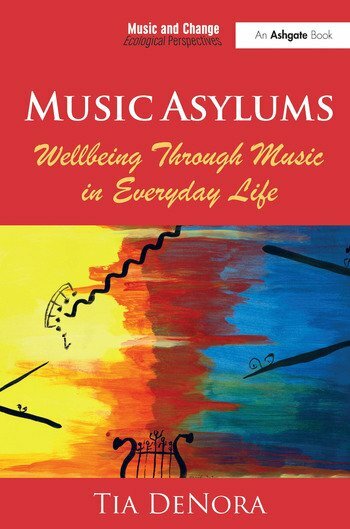 Intended for scholars and practitioners in psychiatry and psychology, palliative care, socio-music studies, music psychology and the allied health professions, Music Asylums showcases music's role in the existential project of being and staying well, mentally and physically, from moment-to-moment and across all realms of social life. Contents: Preface; Introduction; In sickness and in health: defining the ecological perspective; Learning from Erving Goffman, part I: agency and culture; Learning from Erving Goffman part II: reconfiguring the concept of asylum; Music asylums, part I: disconnections, reconnections and removal; Music asylums, part II: making musical space together, furnishing and refurnishing worlds; Musicalizing consciousness: aesthetics and anaesthetics; Where is good music? ; Conclusion: what makes us well and when? And how to know if music helps? ; References; Index. Tia DeNora is Professor of Sociology of Music, in Sociology, Philosophy and Anthropology at Exeter University, UK. She is the author of Music-in-Action, Music in Everyday Life, After Adorno: Rethinking Music Sociology and Beethoven and the Construction of Genius. She directs the SocArts Research Group at Exeter.